Several security issues have been resolved. 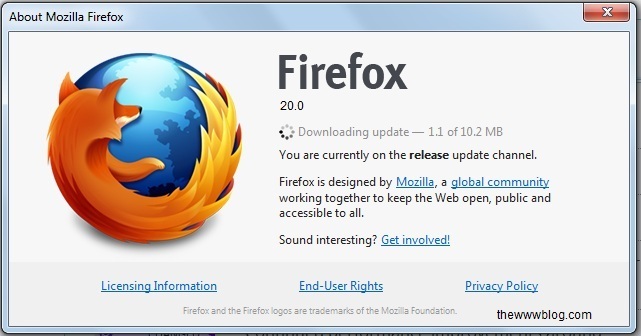 Around 11 critical impacts were resolved in the Firefox 20 version. Private Browsing – Browse the web without saving information about the sites you visit. When you have multiple windows opened, there’s a Per-window private browsing that you can do. Find and manage downloaded files in the new Downloads section, from where you can easily open the folder where the downloaded files are located and there are more options for the downloading files. Awesome bar: This is the address bar which would help the user easily browse through the favorites or open them by typing a few characters from the word. The App Taps, Switch-to-Tab and the New Tab features are all pretty useful for a better browsing experience. Password Manager, Form Complete and the Pop-up Blocker are some important additions internally placed in the browser where you won’t need any special add-ons for those jobs to be done. There are still a few unsolved issues which are listed here and the Firefox team would be working on that and there should soon be some minor updates, which are good for the betterment for the browser but as of now, this update to the Firefox 20 version seems an important one, given that big number of security issues being solved.